For those of you who have been following along on the Twelve Days of Christmas saga, this is year three, which equates to Three French Hens. For the hens, I had our chickens model for me, which was not easy, but eventually they settled down long enough for me to admire their feather structure. I did take some artistic license in using our Dominiques; they do not really come from France, but from a French colony, known today as Haiti. 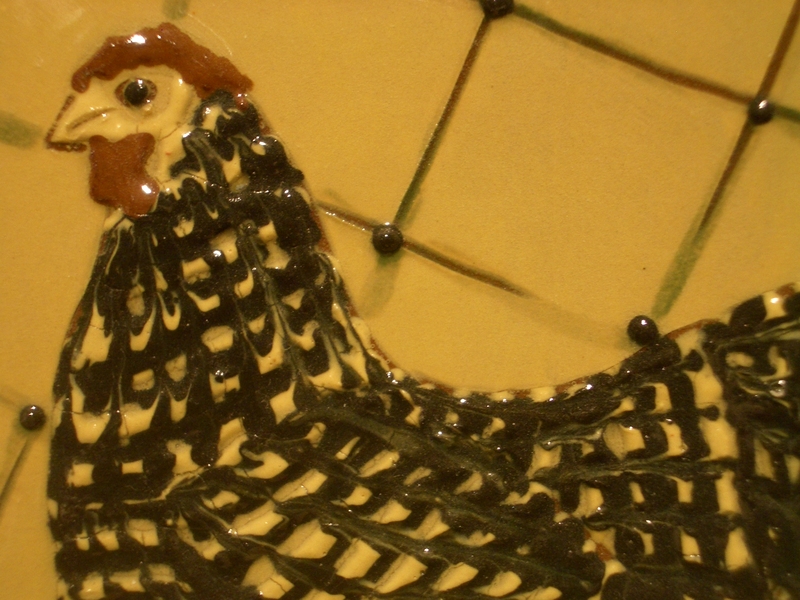 But it wasn’t the actual hen I was after, as much as the technique of early redware, that being feathering, or combing. The Dominiques have such a beautiful feather pattern that was just perfect for this technique. Lines of wet slip are trailed out, following the body parts of the hen. Then, the tip of a real feather, turkey in this case, was dragged through the wet slip, mimicking the feather pattern of our hens. The raised clay gives a nice depth to the hen, and no one’s feathers really get ruffled. You’ll have to go back to other posts to see what the pieces were. Now for next year…Four Colly Birds, yes COLLY. For that explanation, you will just have to wait for next years’ Christmas season post. Although, if you are a Facebook user, Like my page, and you will be able to see it, around June 2015. This series is really beginning to take shape! Only 9 more years! Do not label the glazes on the bucket lids! This is true. I do not do pink pottery. But when you look at the glazed pieces, they are all variations of pink, and light brown. I know, I know! That’s what’s so cool about pottery. 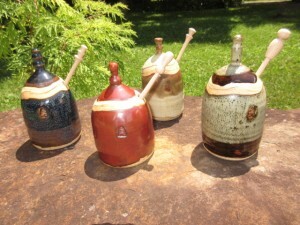 The glazes, simplified, are recipes comprised of clay, silica, and minerals, all crushed up to a fine dust. And they all look like pinks or light browns. I know, I know! So, this mixed up dust is put in water and swirled around, so when you dip in a piece of bisque pottery, the water is absorbed into the porous clay, and the dust sits on the outside. That is what you are seeing in the picture. What you will be seeing though is tan, and greens, and browns, and blues, and reds, and turquoise, and yellow, once these are fired to 2345 degrees. So why does one not label the bucket lids, because one labels the buckets so you know what’s in the bucket…because they all look like pinks and light browns. Again, what does this have to do with Santa? 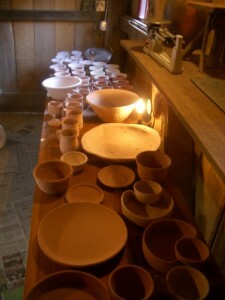 Well these pieces are all being prepared for good little boys and girls in the glaze workshop. These will be available for Christmas. 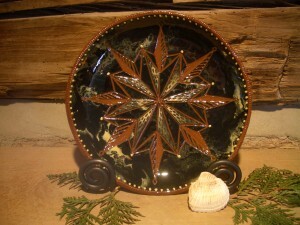 Pottery truly is magic in a magical time of the year! Creationism or Big Bang Theory? 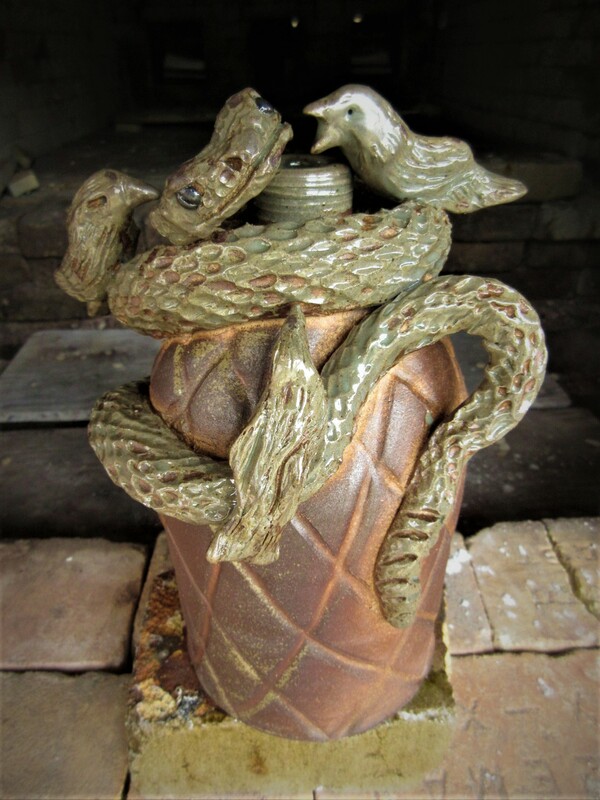 This post is not meant to debate the two schools of thought in the title, but mainly to display how my brain works and how these two ideas worked their way in to my head, out my head, through my hands, and in to redware pottery. 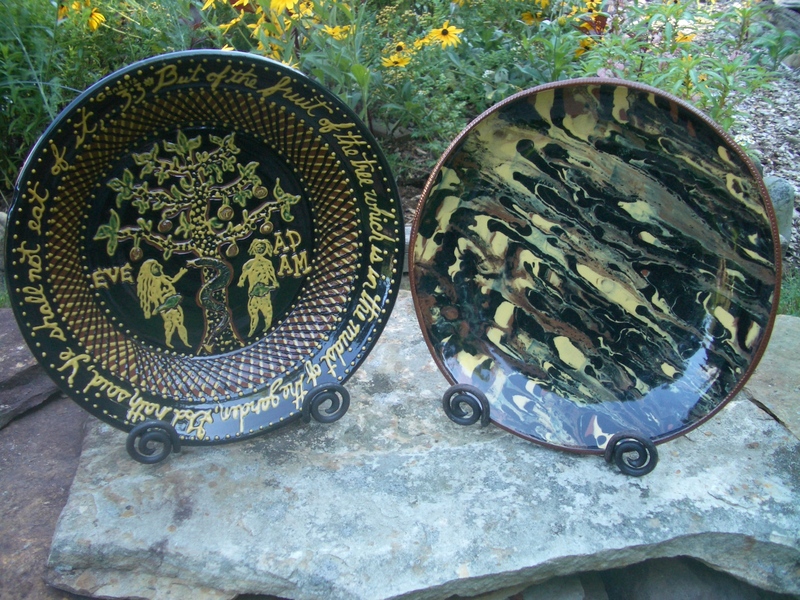 Perhaps it was my upbringing, my home environment and early schooling, that shaped my opinions and beliefs, and drove me with utter passion to creating these plates. Nah. They were just fun to make! The bowl on the left, was inspired by a late 17th. c. plate by British potter Thomas Toft. His Adam and Eve are just as folky as one gets, and they really spoke to me. I also like the Toft technique of slip-trailing the lattice design around the piece. 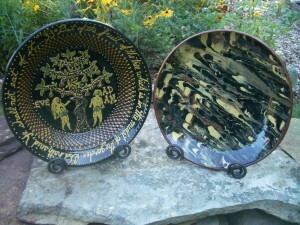 Now the platter on the right is simply the technique of marbling. I was first taken by pieces I saw by Solomon Grimm, Pennsylvania, early 19th c. This was being done by other potters too, but I really enjoy his work. So, as I was looking at these two pieces, I was trying to decide if I would reveal my true feelings about this debate. Nah. But I will say, I’d hate to be on the wrong side when I am standing before the pearly gates. Or, maizy doats and dozy doats…..? What does this have to do with anything? Weird combinations , I suppose. Thought I would post this marbled snowflake plate, inspired by a star plate that Solomon Grimm produced back in the early 1800s. The snowflake instead of a star came to mind a few weeks ago when I was trudging through a foot of snow to get to the studio; after seeing billions and billions of them, (snowflakes) I guess it was just natural to pay homage to the masses. This redware plate is first marbled with slip, then carved through, sgraffito style, with a small piece of tin. Then more slip is added to give it depth. The edge of the plate is textured by pressing the shell in small sections around the rim. So, does all this make sense now? The maizy doats and dozy doats thing is still a little up in the air, but one can google that and find out plenty… and don’t forget, a liddle lamzey divey. Has it really been since last April since I posted????? That’s what being busy, posting on Facebook and blog procrastination does to you, or to me, or to one. 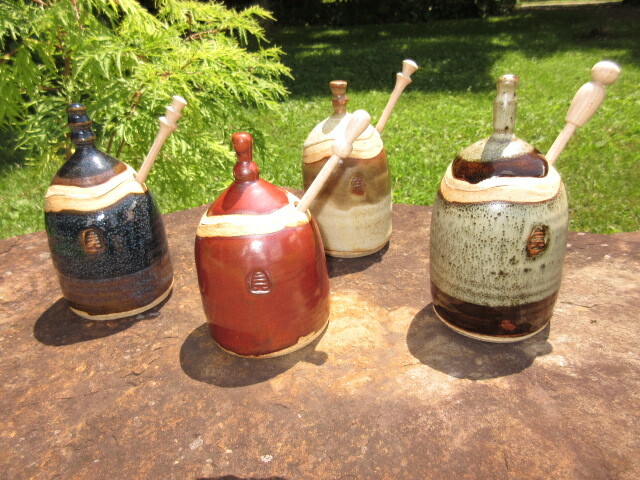 I am still here, creating pots and gardening and enjoying both immensely! 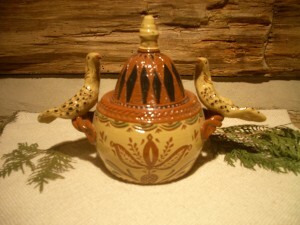 So…, I do remember posting a while ago about the Partridge in a Pear Tree Jar, and promising those who wanted to follow along on the “12 Days of Christmas ” journey, the second piece. 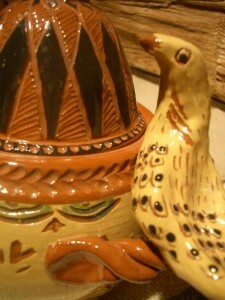 For those of you who are humming the song right now, you have probably figured out it should be Two Turtle Doves. Yes, The Two Turtle Dove sugar pot was finished for 2013 and sent to all who requested. 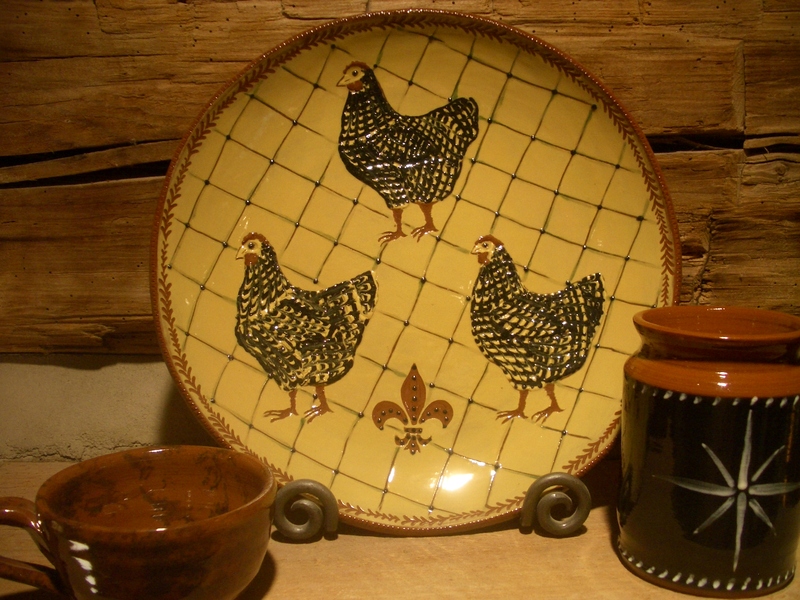 I must say, I wasn’t planning on doing the whole 12 day thing, but am quite excited about it now, and have just completed the “Three French Hen” piece for 2014. After I stopped and thought about this venture, from a practical potter standpoint, because those of you who know me, know me as a very practical sort of potter, I thought to myself, HEY!! What if 10 years from now someone wants a Partridge in a Pear Tree Jar??? So, I started writing down meticulous instructions to my practical self about how many pounds of clay and the steps it takes, in order, so my feeble potter brain in 2024 will be able to replicate these pieces, and glad I DID! The sugar pot takes 30 steps, or is it 31?? Hang on a minute, let me check my notes…..nope, it’s 31. See? So fret not, future “12 Dayers”, I’ve got you covered! 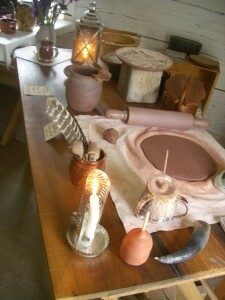 This past week I was honored again to be asked to demonstrate early American redware pottery at New Harmony’s Heritage Days. This is in conjunction with Indiana children learning about Indiana history, although there were plenty of students from States across the rivers; Illinois and Kentucky. As I started with each group I would look down at my work table and was reminded that this was the first time many children had touched clay, learned where it came from, and believe it or not, saw a rolling pin! I would begin with “gather ’round the table”; a fitting phrase to bring friends and folks together to share a moment of fun, refreshment and discussion. We sometimes forget that children engage in different ways, so I am weary when I think they may not care or are not paying attention. But then the questions come, and I realize by them “gathering”, they have learned and take a little bit of me out into the world. So, bring the children to the table, teach them what you know; they may help keep what is important from the past alive so their future will be balanced with reason and understanding of our history. Is there any doubt? A dog is a friend, protector, therapist, cheerleader and playmate. They become part of the family and are sometimes better to have at the Thanksgiving table than human family. Their cherished value has been known and written about for generations; grateful human companions have remembered their friends in paintings and sculptures. 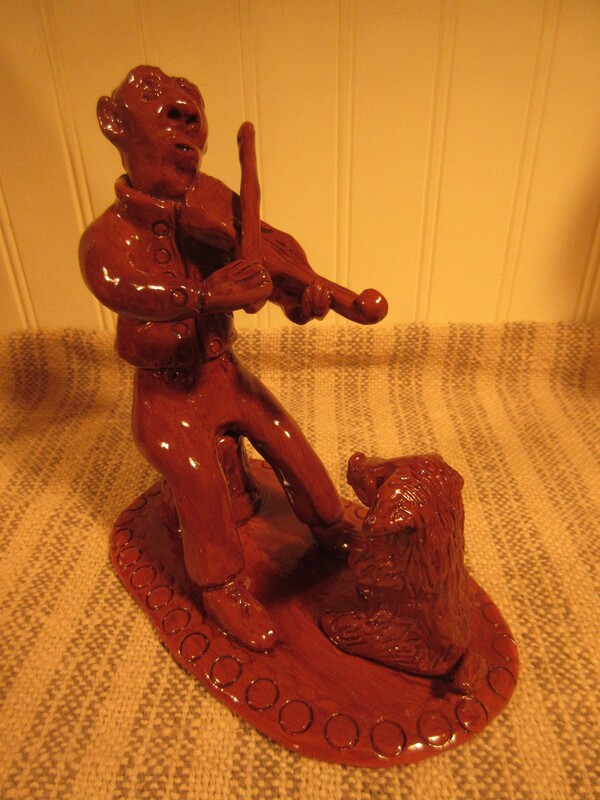 Folk artists have captured endearing characteristics of these friends in clay and wood and have given us wonderful objects that make us smile when we see them. 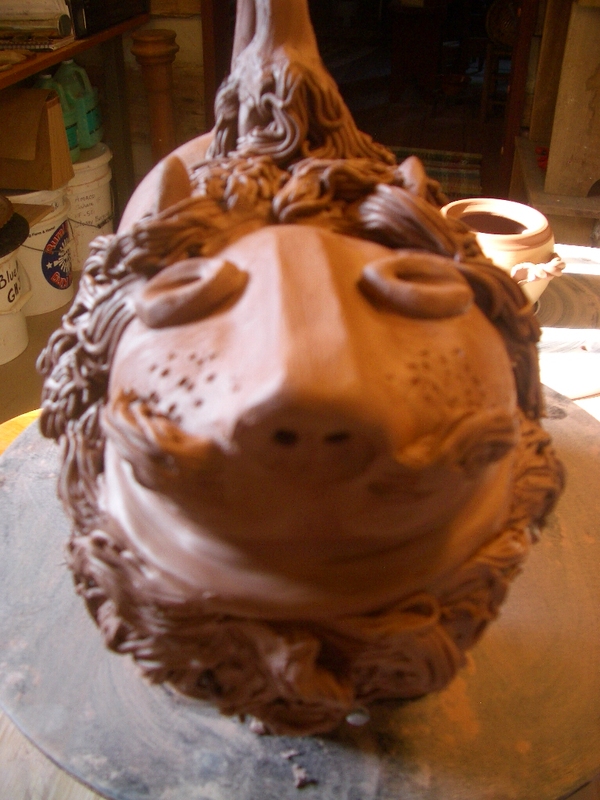 The redware dogs pictured here, are inspired by folk potters of the mid 19th century. They were perhaps used as doorstops or paperweights. What can be better than your best friend bringing you a basket with your favorite libation? And here is another; there seems to be a theme . 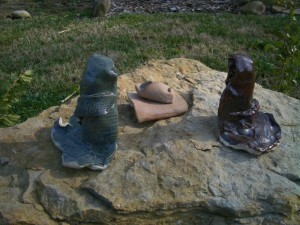 I was reluctant at first to try my hand at these sculptural figures, for fear of not succeeding I suppose. 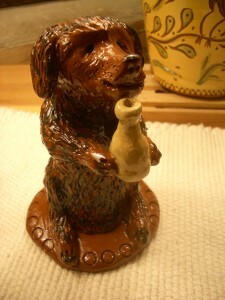 But after doing a few, I too have found the allure of making man’s best friend bring a smile to my face. And to be fair, I also like cats; have recently come into three barn cats, and enjoy the smiles they bring to my face in their barnyard antics. Do I see redware cats in my future? Check out the post before this one to see the “king of the cats”. He’s smiling and definitely makes me smile!! As winter has blanketed the pottery compound with the usual quiet, restful ambience for which the season was designed, folks have been asking me if my hibernation period is rejuvenative? To which I reply, “Yes, it is very restful, in a vibrant, creative way.” Instead of lying around though, I have been ‘Lion’ around, and doggin’ around, and monkeying around! 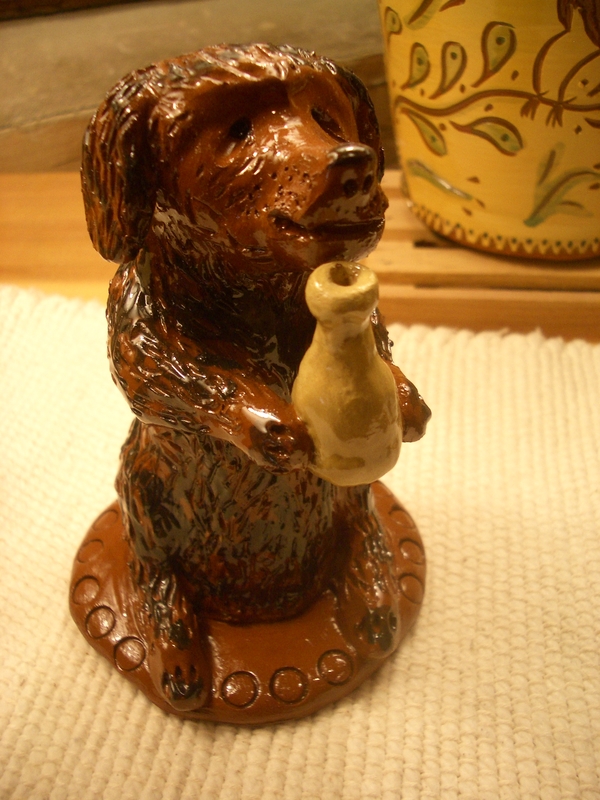 A friend of mine has challenged me to make some mid 19th century redware animal figures, which were used for paperweights and doorstops or just made for fun. I have to admit, I was reluctant to get going; but once I did, they kind of grew on me and became not only a challenge, but a fun challenge; perfect for the winter rest. The lion is the second of the animals and is the most challenging because of the thrown body and head. 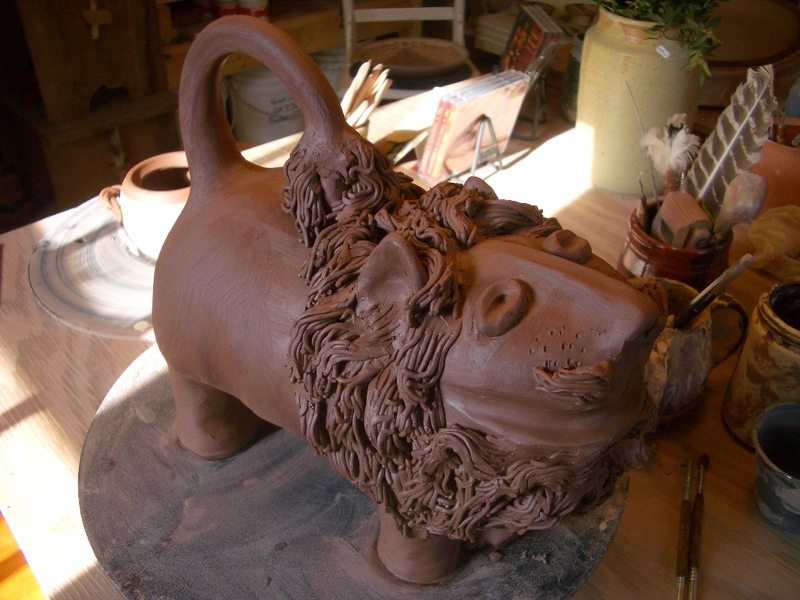 Once those are assembled and he has his head about him, he gets other lion parts like his tail and mane, which is made by squeezing clay through a garlic press. 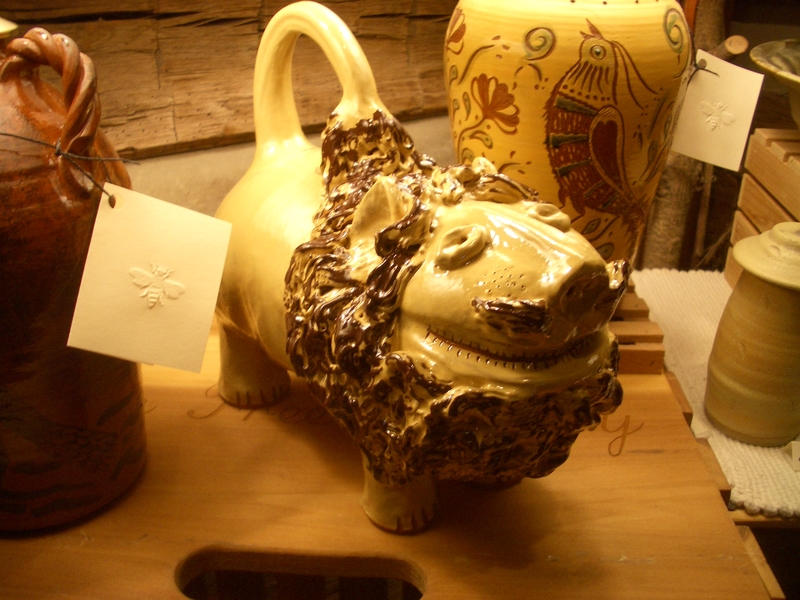 To tell you the truth, I was so happy when I opened the kiln and saw that he had survived and had not become a ‘lion bomb’. (exploding lions can be a real mess) His beautiful smile was looking up at me saying, “all is well Tom, you should have a lie down”. So I think I shall, keep ‘lion’ around, because it really does rejuvenate the creative spirit. Winter will be soon be gone. 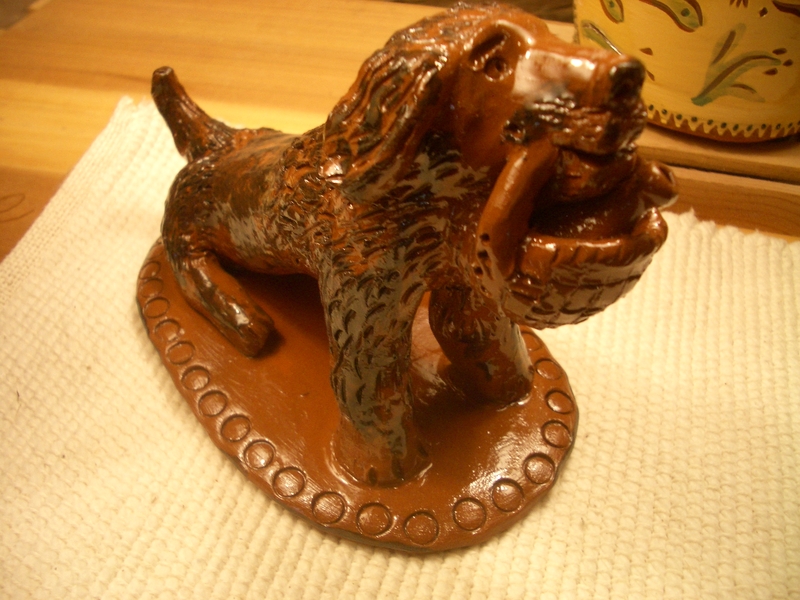 Redware lambs, dogs, and monkeys riding dogs, (sorry OZ fans, no flying monkeys) to come in future posts. Oh, and a bear or two too! there shown a holy light!